These young men are learning different trades. They are with me on most of the projects. We do masonry work, carpentry, plumbing, roofing, welding, and various other technical trades. The Thiotte Church joined with us several years ago. They built a nice stone church and were not able to add the finishing touches. We are now helping them to finish the building. As you can see it needed windows and the gable ends finished. The front door and 2 others were installed this past week. We will be returning soon to close in the building completely. Here is a before and after of the windows that we done at Thiotte. The congregation was not able to continue with the construction themselves and asked for help. The building had no doors or windows and we were able to make steel doors and lay decorative block for the windows. The gable ends need to be blocked in. While we were there we were able to make the blocks and now we need to return to lay the blocks. The rooms where we were staying was invaded by several little cridders. Every evening before going to bed we had room check. We took a flashlight and searched the room for scorpions. 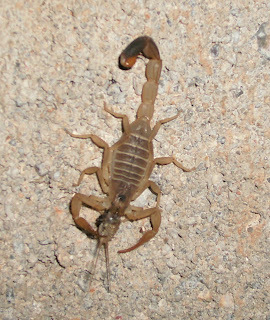 We had around 4 or 5 scorpions to kill nightly. We also had a problem with ants. When we were getting adjusted to the scorpions and ants another creature joined us. It rained in the afternoon and in the evening the crabs began to crawl around. They were on the roof and on the walls. They were everywhere to be found. We didn't mind them as much because they became a source of food. We boiled them and ate them. This is the outhouse. We began digging the hole and we ran into rock. We couldn't chisel the rock so we had to build some of the pit above ground. We now need the door and the roof and it is ready for service. The plastering was the next stage of the construction.